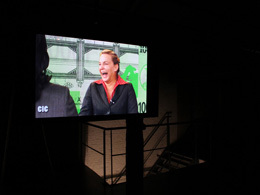 As part of an elaborate exhibition programme titled The Good Life in the city of Potsdam, two works will be screened by Vermeir & Heiremans: The Good Life (A Guided Tour), 2009 and The Residence (a wager for the afterlife), 2012. The exhibition programme runs from the 10th until the 12th of October, with presentations on multiple locations. The screenings by Vermeir & Heiremans will take place on the 9th of October, 5 pm, at Filmmuseum Potsdam. The same evening, works will be shown by Bellini Academy, Tamás St. Turba and Corinna Schnitt. The Good Life builds on the 2014 project Faszination und Fassade, which examined the transformation of Potsdam and the lack of spaces for contemporary art. First and foremost, The Good Life concerns itself with exploring people - and people’s relationship to the environment in which they live. In doing so, the exhibition addresses social, sensual and ethical themes of being on a broader level. The Good Life presents numerous newly created works forming a dialogue with selected historical pieces. The concept of the good life has captured imaginations since ancient times - since human existence ceased to be driven solely by survival and began to be characterized by civilization and reflection. In Potsdam, the good life frequently feels close enough to touch. With „blossoming landscapes”, palaces and parks, the city is enjoying increasing popularity and a seemingly higher quality of life than in other places. It’s also here that the aspirations of many for private fortune have brought about complex displacement processes. Julia Antonia (DE), Bellini Academy (FI), Silvia Klara Breitwieser (DE), Birgit Cauer (DE), Katrin von Lehmann (DE), Jackson Mac Low (US), Timea Anita Oravecz (HU/DE), Reiner Maria Matysik (DE), Sandra Riche (FR/DE), Corinna Schnitt (DE), Bettina Schilling (DE), Bettina Semmer (DE)/Federico Guzmán (ES), Tamás St.Turba (HU), Anna Werkmeister (DE), Cécile Wesolowski (FR/DE) and Ilse Winckler (DE). The Good Life is a project by Neues Atelierhaus panzerhalle e.V.